I am a multi-media artist, graphic artist, photographer, web-designer, wife and mother of two teenagers. I have an associates degree in Commercial Art and a bachelors in Art Education. I am in love with learning new things, if not in a formal classroom than in my own room, learning from necessity by turning a “mistake” into art, or by “making do” with what I have on hand. 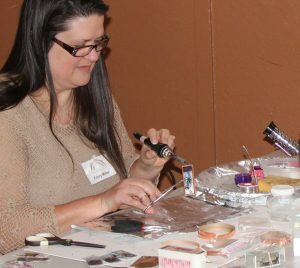 My experiences with several art mediums have taught me to think creatively in all endeavors and turned me into a bit of a jack-of-all-trades. I’ve been concentrating on my glass cutting and soldering skills this year. 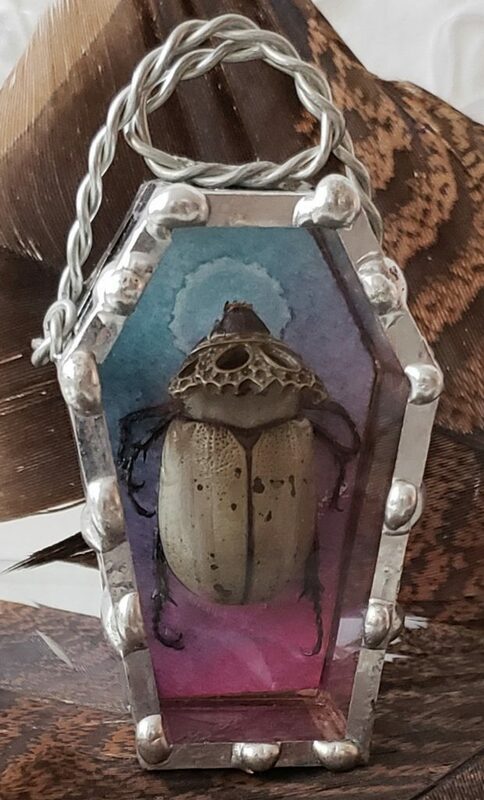 It’s been 5 years since I made my first batch of “bug coffins” and I have quite an assortment of subjects to create with, very exciting! I’ve also been making “emm’s art charms”. 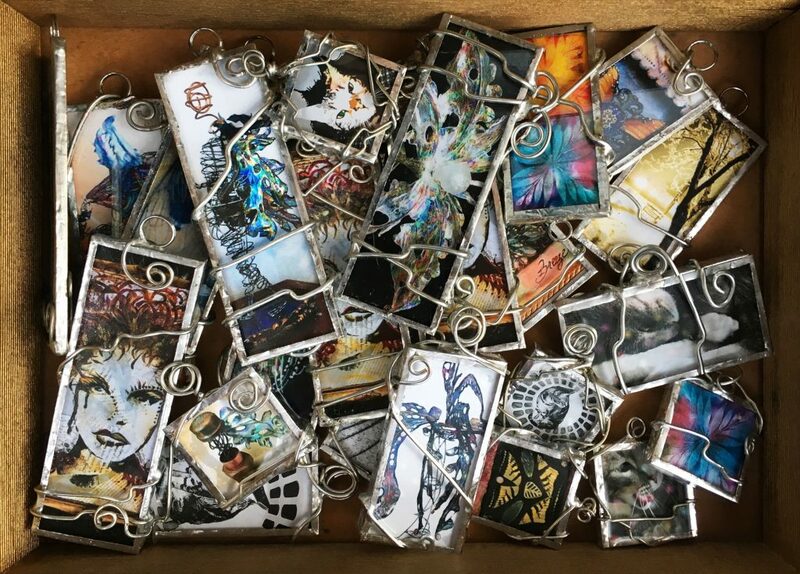 They are charms I made from photos I took of art I’ve created. Very fun! I enjoy creating in a wide range of mediums: collage, photography, sculpture, paper arts, as well as graphics. My first love was sculpture with traditional clay. In the last few years, I’ve been playing a lot with wire and homemade paper clay. Many of my art pieces begin as two dimensional but usually grow into a mixed media relief. I am most intrigued with mediums that are a bit unpredictable. Like the Fantasy Film, I quite often use. I love taking it from a 2-dimensional form into 3-dimensional wings and or other melted film art creations. I also use fabric, found objects, jewelry, photos, wood, paint, glitter, wire, organic objects and any other type of ephemera I find pleasing (including bugs!). I serve on the board for Made In Clarkdale and volunteer for P.E.O. (a philanthropic educational organization for women). Then I try to squeeze in some art here and there between walking the dog, petting the cats, feeding the kids and happily spending time with my husband.